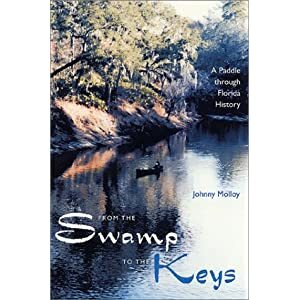 This book is a recount of an adventure, paddling the state of Florida by water. I paddled a canoe from the Okefenokee Swamp, headwaters of Florida’s most famous river, the Suwannee, and down the Suwannee to the Gulf of Mexico. From the Gulf, now in a sea kayak, I paddled south past Tampa Bay into the Everglades. From the Everglades I continued south to end at Long Key and the Atlantic Ocean. This book explores Florida without boundaries. Some of my opinions are sure to raise the ire of readers, as I examine population, preservation, political correctness and the changing South. I come down on one side or the other of any given issue in order to get the reader to think about the issue and make a stand of their own, whether they agree with me or not. The point is to get you to think. The mix of true episodes on the paddle trip and characters met along the way are all woven into the fabric of Florida’s history. This combination will make readers laugh, cry, shake their fist, and maybe inspire them to get into a boat and strike out to make some memories of their own. I just read, then rode, wave upon wave. It went like this: get pushed atop the wave, top out then descend into a trough. Repeat. Get pulled here, then there. Abruptly, a wave picked up the rear of the sea kayak, turning the boat 180 degrees and parallel to an incoming surge that crested above me. Here it came, the swell destined to take me down and push me over. With no time to move I leaned into the rush of green power and dug in the paddle, remembering Tom’s suggestion. The salty splash popped my face just as I closed my eyes. In that dark moment of slow motion I began to fall to my left, and dug in further, grasping the paddle with a death grip. The wave crest passed over me, and then the kayak fell as if in air into a deep trough to my left. I opened my eyes and was still upright, though my hat was off my head, hanging by a string around the front of my neck. My panting shortness of breath and the feeling of impending doom briefly returned. Then I turned the experience around: If I can survive that wave I can survive another. Anna Maria Island became my goal at this point. Making Egmont Key was a pipe dream. The wind and sea ruled here, pushing me southward. Anna Maria seemed far away, just a flat line of trees with specks for houses. Egmont Key was due west. The waves just kept on, and the fear evolved into a gut ache, like waiting for test results to come back from the lab to see if you have cancer. I passed near another bell channel marker at the south end of Egmont Key and began to feel the effects of the Southwest Channel, another entrance into Tampa Bay. The tide here began pushing me around, though not as wildly as before. The trees and houses of Anna Maria Key were getting closer, slowly but surely, a slow motion relief. I began heavy power paddling, not forcing the paddle though, for there was no forcing my way through the waves, but rather riding the waves and stroking hard when possible. Passage Key, just a sandy spit, was ahead. The shallower water near Passage Key lowered the crazed sea, but the undulations were still hitting hard – as if the entire force of Tampa Bay was slamming into me. A look on a map will show that the northeast wind is exactly the worst direction wind to have in this spot. Passage Key had felt the effects from high winds in times past. This sandy spit of 30 acres had been a wooded mangrove island with a fresh water lake when the U.S. established it as a national wildlife refuge in 1905. In 1920, a hurricane flattened the island, turning it into the meandering barrier island it is today. Because of its small size and importance to nesting birds, Passage Key is closed to public use. Passage Key looked especially small in the waves, as I paddled southeast, finally making the shallows of Key Royale Bar. This sandy shallow at the head of Anna Maria Sound was beaten by quick, crashing waves turning over the bay floor. I splashed through the whitewater and the deeper, rolling waters of Anna Maria Sound – my arms were positively aching and I was chilled colder than a twelve pack of beer at a November tailgate before a Tennessee-Kentucky football game. Paddling slowed the cool down, at least stabilized the chill toward hypothermia, before I finally stopped in a spot out of the wind near Cortez. Movies last around two hours right? Well this horror movie lasted about that long. Except it was real. I could have waited another day at Mullet Key, and probably should have in retrospect, but I didn’t and learned my lesson, a few lessons for that matter, one of which was don’t cross Tampa Bay in big winds. The other was don’t risk your life for 33 dollars. I swung around to the east side of the island — mostly marsh with a few red mangrove trees. This is the northerly limit of this coastal tree. Mangroves are one of the few trees that can tolerate growing in salt water. The secret for them was the ability to obtain freshwater through saltwater, by secreting excess salt through their leaves. Red mangroves are also known as the “walking tree.” This tree grows at the water’s edge, its trunk supported by numerous tangled red roots, known as prop roots, since they prop up the trunk of the tree. These roots give them their nickname, as they seem to walk on water. Mangroves may not actually walk but they do benefit Florida’s coastline. They provide a sort of protective nursery for small fish, crustaceans and other shellfish, which in turn are fed on by larger fish. Mangroves are rookery sites for coastal birds, like pelicans and roseate spoonbills. For human coastal residents, mangroves absorb wind and waves coming inland, stabilizing shorelines with their roots. Mangroves reproduce interestingly. Seeds sprout on the tree, and a mini live mangrove eventually drops down into the water. From there the winds, currents and tides find it a home, where they sprout roots and grows to produce seeds of their own. So, in this case, the fruit may not fall from the tree, but it does have legs. These tropical mangroves here were small. The Suwannee area is the mangrove equivalent of the North Pole, this is the most northerly latitude where mangroves survive, and cold snaps like the one I’d paddled through can kill them. They fare much better in South Florida, especially the Everglades where they reach their greatest heights and concentrations. From the mangroves, I banged and bashed my way to the island interior, where a small evergreen shrub, yaupon, grew abundant. Florida’s Indians made a concoction from yaupon berries that English-speakers called “black drink.” The berries of yaupon make an emetic, and the Indians drink the “black drink” and throw up, purging themselves during certain rituals. That’s the funny thing about Indian words, we’ll never know exactly what they were, what they meant or how they sounded, only the English corruption of such. Florida Indians may have called the drink “eye of the god,” or “kool-aid” for all we know. The appropriately named Spanish bayonet, a bush with sharp pointed leaves, ambushed my legs at every opportunity as I walked through the dense growth. I found a couple of other camps, unfortunately with too many beer cans. Stacks of crab traps were piled by an old tin-roof shack. In the marshy edge a bird, an American bittern, waded the shallows, slowly and methodically looking for an aquatic meal. It spotted me and froze with its bill pointing skyward, trying to blend in with the background of marsh grasses. One of the most fascinating aspects of God’s creatures is their individual evolutionary track on thriving and reproducing here on earth. For some reason, the bittern’s implausible defense had worked enough for it to be in the genetic program. The wind picked up and I retired to the campsite. I lay down in the warm sun on a bed of pine needles 3 inches thick, smoking a big ol’ cigar and thinking. How unfortunate that natural beauty is sometimes its own demise, by way of man’s mess-making. For, if a natural creation of God is never viewed, how can its beauty ever be gauged? To be gauged, it must be seen – once seen, it will gain attention. Once it gains attention, it will gain notoriety. Notoriety may bring its downfall and possible demise. My life seemed so short and insignificant when compared God’s creations. What lasting contributions would or could or should I make on this earth? To this earth? Or was my function as a human being to tread lightly, then go away? What was my purpose? What was the purpose of this land? The answers were not easy or clear. This journey was just one foray among many, all amounting to a lifetime spent trying to answer such questions. Later, I enjoyed my first Gulf sunset of the year. The colors imperceptibly yet unmistakably transformed from yellow to red to orange to pink to gray. I sat before the fire — the temperature had already dipped into the 40s — turning back every once in a while to see the sky darkening through the intertwined limbs of live oaks. The wind died and the night quieted, save for the hissing of firewood, as the fallen tide and lack of wind rendered the ocean mute. The sounds of the woods, especially my hoot owl companions on the Suwannee, were conspicuously absent, as I drifted to sleep under the stars by the fire, feeling the soreness of a new way of paddling. This workout was better than I could get in any health club. In the days of the Indians and settlers, just getting along day-to-day required plenty of hard work and exercise for the average person. Nowadays, most modern peoples just hunt money, instead of food and shelter directly. Most jobs consist of button pushing, talking on the phone and watching something. A few hundred years ago the thinking world would have laughed at people pedaling away on stationary bikes, lifting weights and doing calisthenics by the name of aerobics, led by a personal trainer. You’d think with all the mirrors in those fancy health clubs that some of those spinners would notice they were going nowhere fast. The cold night dipped below freezing again. Once I got up, I noticed the tide was low, way low. A big mud flat separated me from the water, so I waited for it to come to me. I hung around the campfire, drinking coffee and warming my toes – through three pairs of socks. Remember, wood warms you three times: when you gather it, when you break it up and when you burn it. Sometimes it’ll do a little more, like burn things too close to burning wood. My wool socks were burning and my feet were in ‘em! I pulled my dogs away but the damage was done. The outer pair was ruined. The remainder of said socks went into the fire, stinking up the camp with an odor not too different than human hair burning. After all, wool is just sheep hair. I was now anxious to leave Deer Island, one pair of socks short.